Britain formally recognised the independence of Afghanistan in the Anglo-Afghan Treaty of 1921, which also provided for each country to open a legation in the other’s capital. Lt.-Col. Francis Humphrys, after a career in the Indian political service, arrived in Kabul as minister early in 1922. 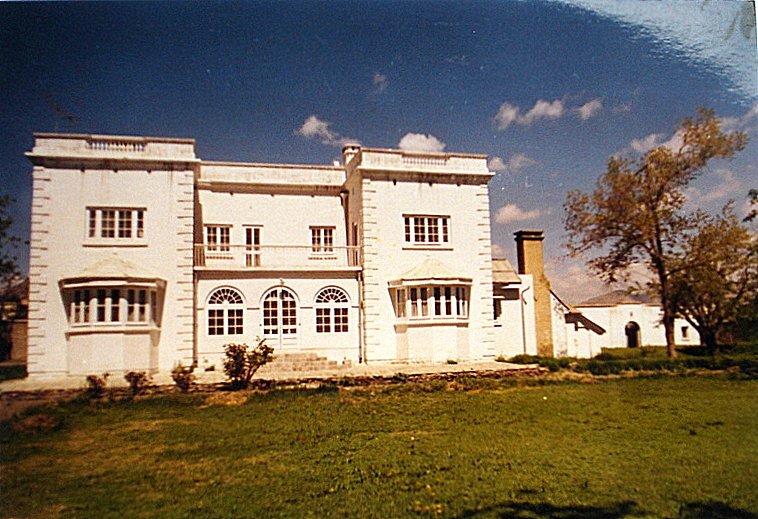 He leased accommodation for the legation from the Afghan government in the centre of Kabul in buildings known as the Olia Saray, which had previously housed Amir Habibullah’s harem, while he found a site and built a permanent legation. 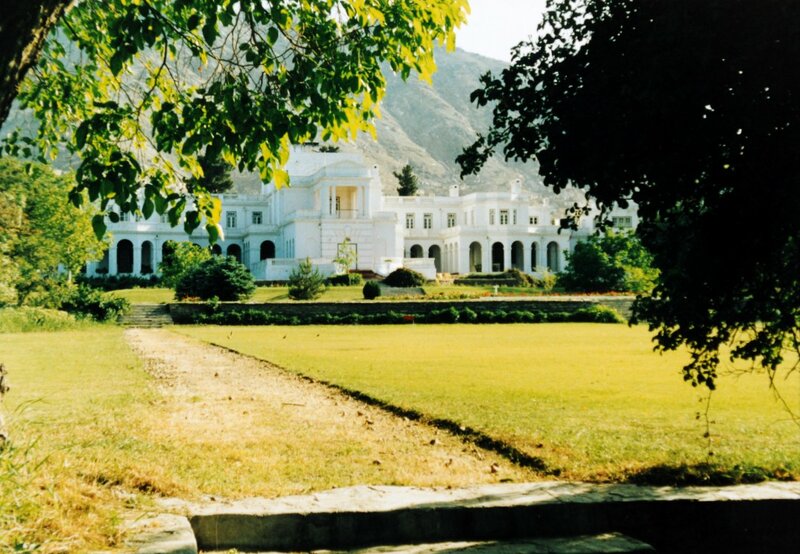 Humphrys chose a site of 26 acres at Karte Parwan, about 2½ miles from the centre of Kabul. It comprised twelve individual plots and these were bought by as many sale deeds by the Oriental Secretary, Sheikh Mahboob Ali, in his own name but ‘…on behalf of the British Legation and is the property of the British Government…’. The legation buildings were designed by Basil Martin Sullivan, a British architect who moved to India in 1913 when in his early thirties and spent most of his career working for the Punjab government, retiring as its superintending architect and town planner in 1938. He designed many of the public and civic buildings in Lahore and was, geographically, the closest British architect to Kabul. 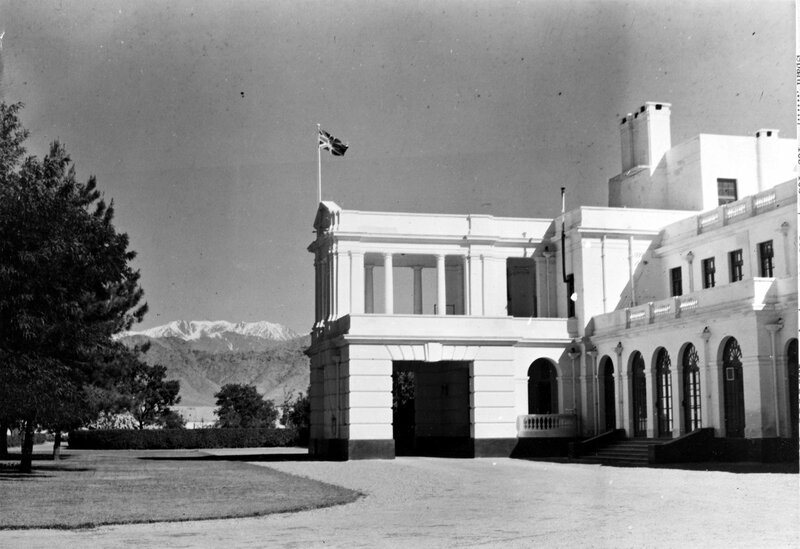 Sullivan laid out the main compound with the residence on a wide platform looking north-east across a large formal garden to the mountains beyond. 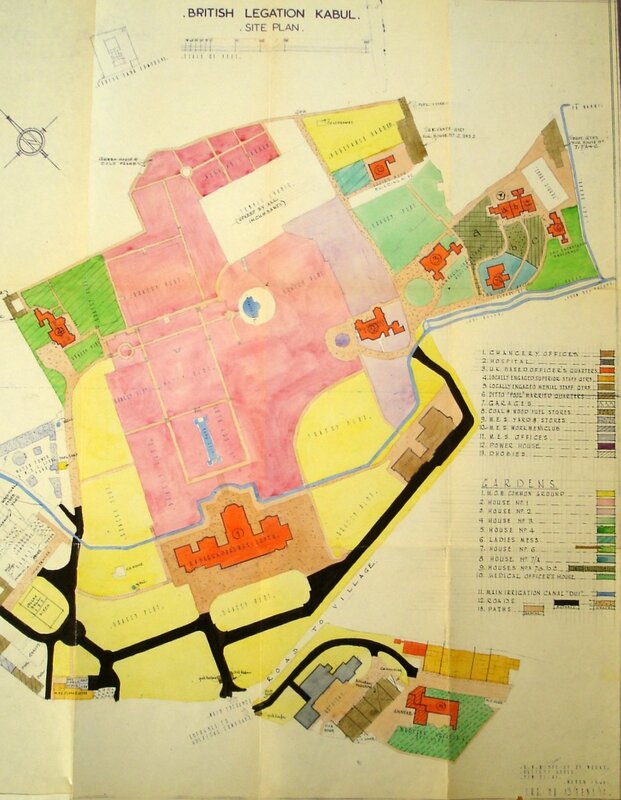 Separate and dispersed buildings, out of sight of the residence, included chancery offices, 5 detached houses for senior staff, a pair of semi-detached and a row of three houses, lesser free-standing buildings for clerks’ and superintendents’ accommodation, and a village for stables and servants’ quarters. Across the road, opposite the main gate, was a small compound of two acres for the hospital and the oriental secretary’s residence. The residence, on two floors, looked huge on account of deep verandas around every side, with a squash court at one end and a greenhouse at the other but in reality it was only one or two rooms deep. 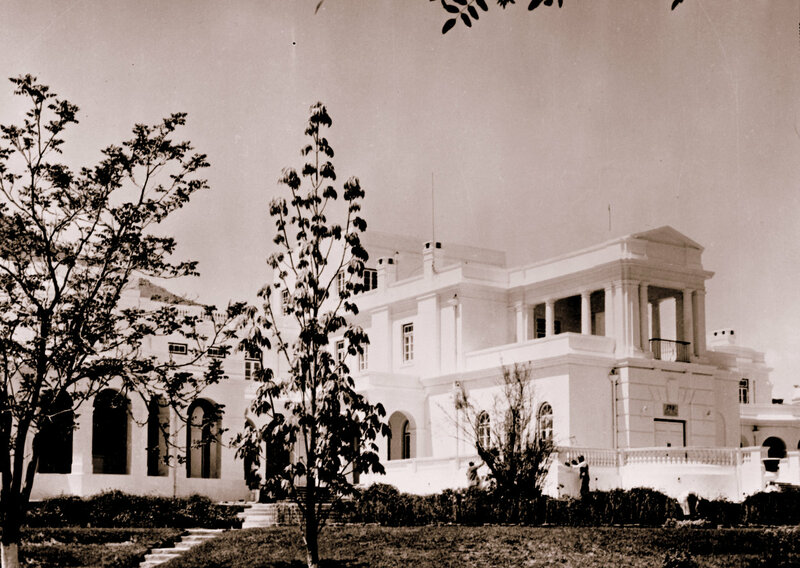 Legend has it that Lord Curzon, Foreign Secretary until January 1924, wanted the Kabul residence to be the best house in Asia: Sullivan went some way towards fulfilling that brief. But it was said that he made one mistake: used to designing against the heat of India, where houses faced north to avoid the sun and catch the breeze, his north-facing Kabul houses instead caught the freezing winds. Construction of the compound took three years from 1924. Most of the building materials came from India and were carted from Peshawar by traction engines over the Lataband Pass. Rebellions, a local timber shortage, passport regulations and other interferences all contributed to the frustrations of building a palace in a remote location lacking local infrastructure. The leased legation premises in town were completely destroyed by fire in the autumn of 1926, mercifully not before some of the lesser buildings on the new compound were far enough advanced for the legation to move into. The cost of the land and buildings was about £175,000 in total, met from Government of India funds. 1928 and most of 1929 passed happily for the legation: wives and families were living comfortably on the compound and in the autumn of 1928 a large reception was held which Afghan ladies attended in European dress. But it was not to last. The Emir was deposed in 1929 and fighting broke out between his supporters and those of his usurper. In mid-December 1929 the legation lay between the opposing forces and was cut off from the town and other legations. The staff, neutral onlookers, mainly took refuge in the residence because anyone appearing in the grounds was fired on. They watched as fire destroyed the military attaché’s house on 19 December, and stray shells and bullets caused extensive damage throughout the compound. The indomitable Lady Humphrys recorded in her diary ‘bullets in the squash court, 3 in the bedroom, 3 near my bed, 3 in our own bathroom, one missing the Minister by 6 inches’. It was she too who organised the tearing up of white sheets into strips to be laid out in block letters on the lawn so that, when other communications failed, messages could be read by aircraft flying up from Peshawar. On 23 December 1929 began the world’s first airlift, carried out by the RAF using mainly Vickers Victorias and DH9As and flying in conditions of extreme cold and at altitudes for which the planes were never designed. First to leave were the British women and children, followed over the next two months by the rest of the British and foreign communities, 586 people in all. The evacuation continued even when the snow on the airfield had to be trampled down to allow the planes to land. Seven Victorias made their last trip on 25 February 1930 to pick up the Legation staff; flying out of Kabul on the last plane was Sir Francis Humphrys, accompanied by his parrot and carrying the Legation Union Jack under his arm. Remarkably, no lives were lost. The legation staff returned in May 1930 and had all essential services at the compound working again within the week. 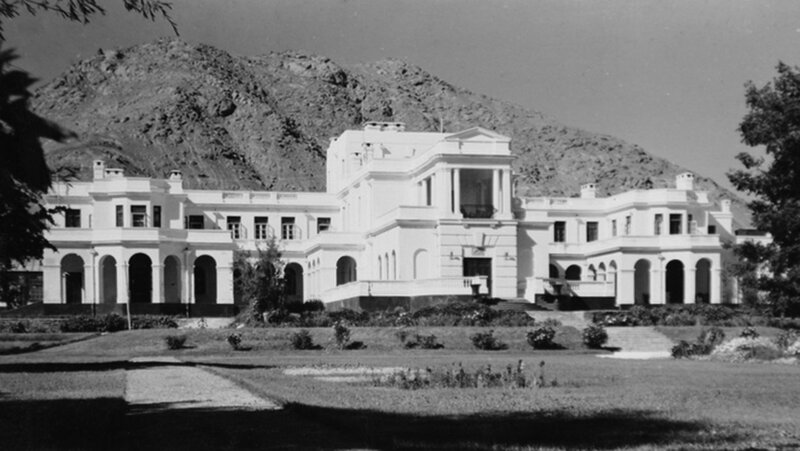 After the partition of India in 1947, India and Pakistan jointly laid claim to the Kabul compound (where the legation became an embassy in 1948). At this time, the compound was maintained by the Military Engineering Service of the Pakistan government (though repayment, like rent, was left for later argument). Diplomatic relations between Afghanistan and Pakistan were broken for several years after 1960 and all Pakistani staff left, to be partially replaced by Gurkha ex-servicemen. Agreement was reached in 1963 between the Indian and Pakistan governments that the compound should pass to the Pakistan government, whereupon it requested possession. The British government recognised Pakistan’s legal title in 1968 and communicated its willingness to enter into discussions about the future of the property and/or a financial settlement. 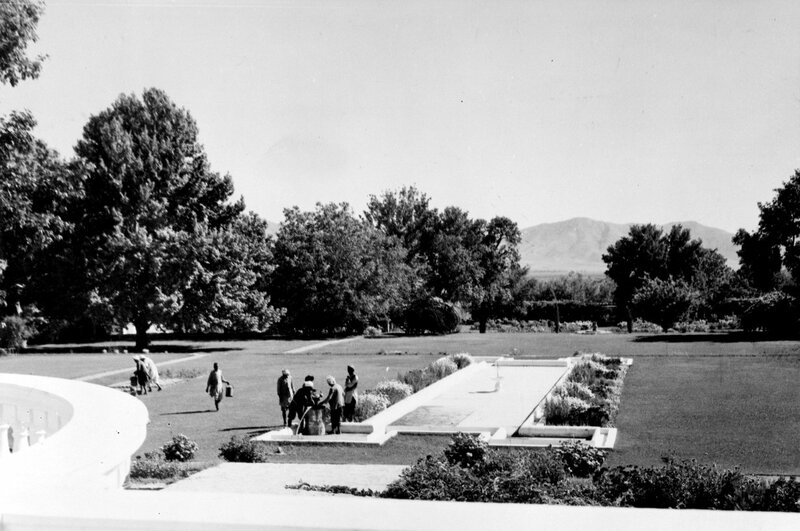 In 1973, the Afghanistan government announced that the British government could not transfer the property to any body other than the Afghanistan government. The Pakistan government agreed in 1975 that it would accept compensation instead. The British government, which no longer really needed so large a property, thought that it might be worth buying out the Pakistan government and then selling the compound to the Afghanistan government, all in the region of £250,000. By then, the embassy’s commercial section was in leased offices in Shaheen Building in Sa’adoun Street. 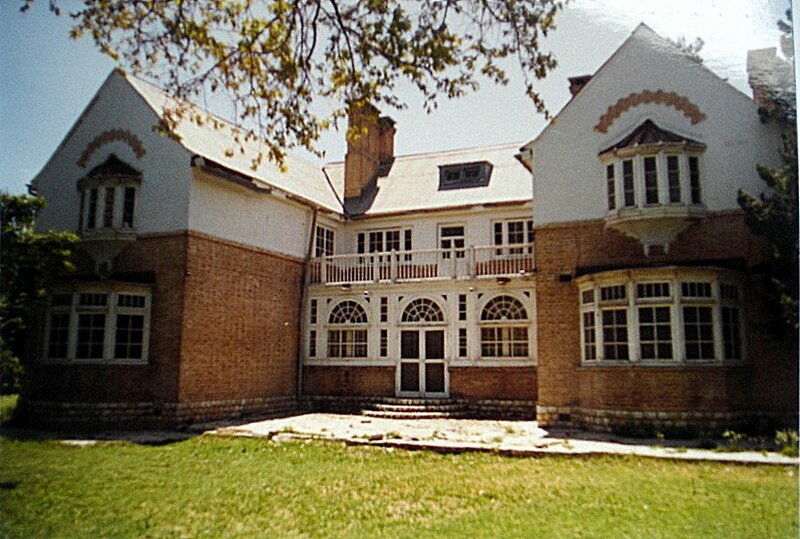 British diplomatic relations with Afghanistan were severed in 1989 and the embassy was evacuated. Despite the periodic preparation of negotiating briefs, no real discussions about the terms of the transfer to the Pakistan government took place until 1993, following a formal indication that it now wanted the property. The British set out conditions, including that transfer would be in full and final settlement of any claims over the property, and that the British government would continue to enjoy use of House 5 in perpetuity and free of charge. The condition, though not fully agreed, was subsequently switched to the small Hospital compound across the road. The main Compound was transferred by Exchange of Notes on 16 May 1994. 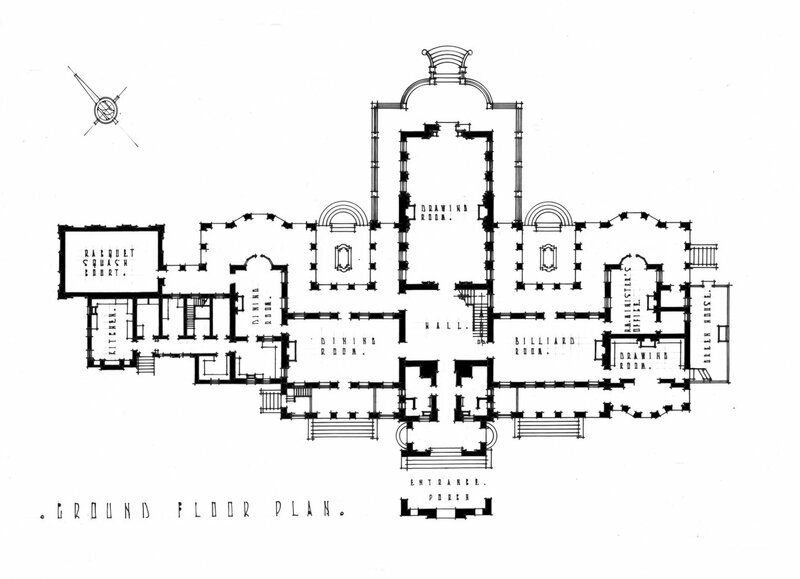 Residence ground floor plan, 1948. 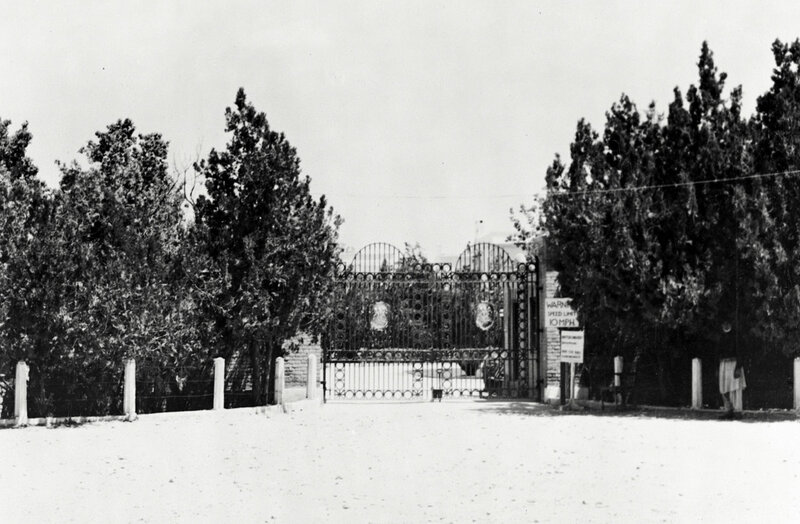 Entrance gates to compound, 1965. Entrance front, from the south-east, 1965. 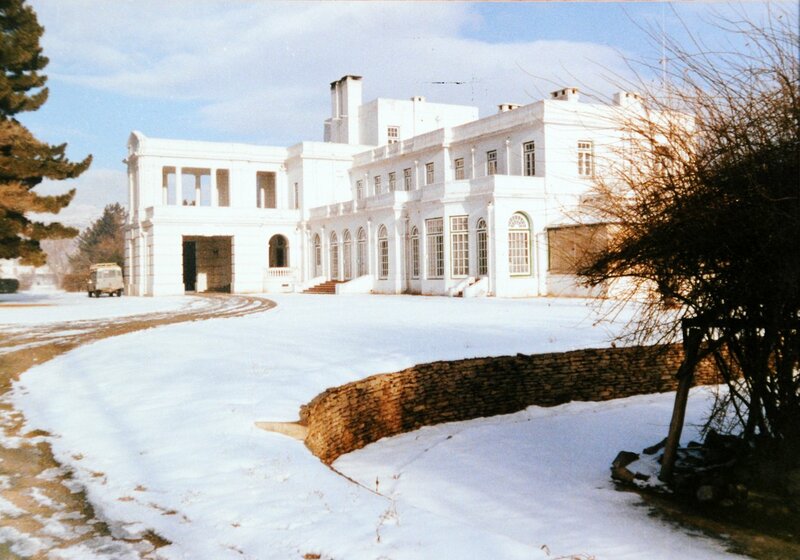 Entrance fron in winter, 1989. 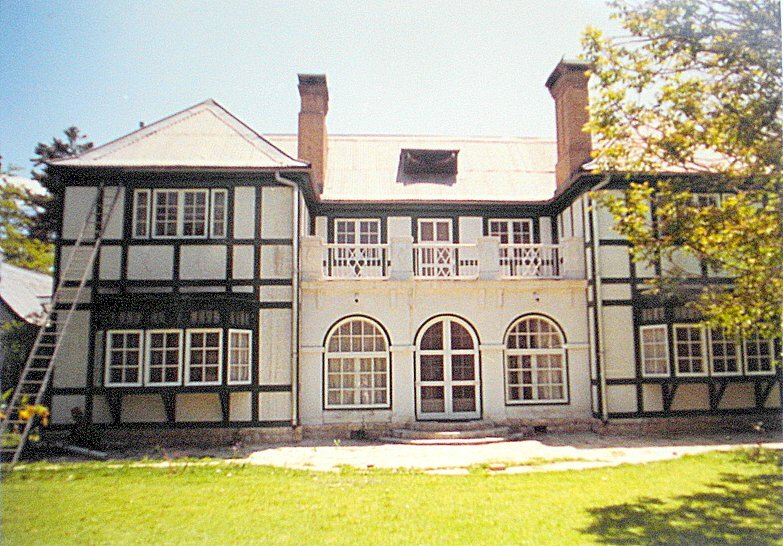 North, garden, frontage of the residence, 1987. Garden front, from the east, 1965. 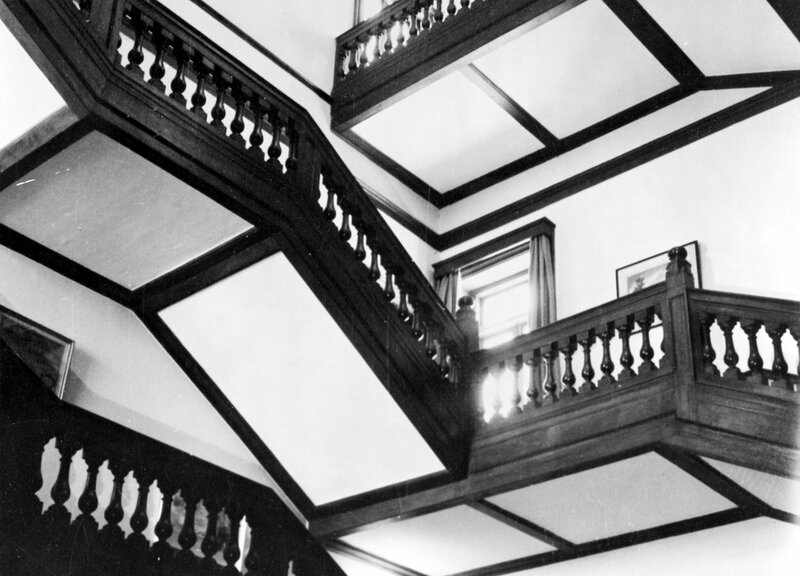 View north-east from the drawing room, 1965.